Traits is an archived article about material previously included in Diablo 3. However, it has currently been removed or the article contains outdated facts. The information is stored in Diablo Wiki for posterity. Please note: Links in this article lead to both updated and archived material. Traits and Passives have gone back and forth over Diablo 3's development but they are essentially the same thing, secondary skills that bolster the Active Skills. They are now called Passives. Details about Traits prior to its removal have been saved for posterity. Traits are a separate set of skills, all of which are passive, that provide strong bonuses for the active skills and general character abilities. Characters do not earn enough points to use every trait, or even most traits. Choosing which traits to spend point in allows each character to specialize their play style in unique fashion. Every trait in the game is described in its own wiki article. View them all on the Traits master list further down this page, or click to any of the individual class traits pages to see which are available. Traits implemented into the game during 2010, when all passive skills were removed from the skill trees. Many existing passive skills were (more or less) directly transformed into traits, while lots of others were added to fill character needs. 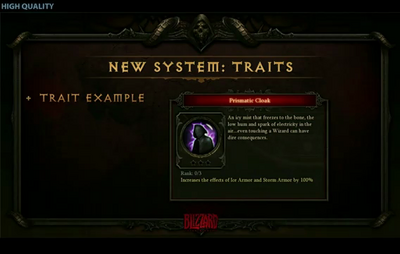 Traits were first revealed during the Diablo 3 Gameplay Panel in Blizzcon 2010 by Jay Wilson. Traits provide substantial bonuses to all active skills and stats, essentially allowing a player to upgrade a specific skill or playstyle which defines them and their build. The skill system has been totally revamped, and we’ve added an all-new traits system. The skill system we showed last year was fairly Diablo II-like. We knew at the time that the basic mechanics were sound, but we felt it was intimidating, and that it overly encouraged spreading your points around into as many different skills as possible instead of focusing on the skills that fit your play style. If you’ve spread your points into 30 different skills, then you’ve broken your character. The system wasn’t facilitating playing the game well. We also moved passive skills into their own UI, and renamed them traits—because no matter how good a passive skill is, it’s hard to pass up picking an active skill instead. The traits tree allows us to expand the number of passives and focus on core character customization ideas like, “I want more health,” or “I want more damage.” It replaces attribute-point spending, which we didn’t consider to be a very good customization system because there was always a *correct* way to spend points. With traits, players will find there are a lot more choices to make that will be better balanced against one another, and will include flavorful or role-playing choices to cater to a broader group of players. As of October 2010, trait points are awarded every other level (1, 3, 5, etc). There are about 30 traits per character, though this number may be reduced/condensed in further development. Traits can have 1, 3, or 5 points placed in them, with the number varying between traits. Traits are not all unique to each character. About one-third of the traits are found on two or more classes, with a fair number spread across all five classes, though their Clvl requirements may vary between classes. Many traits are unique to individual classes, and have special bonuses that are only of use to that class. The main goal of traits is to allow players to really customize the build of their character. This is accomplished by the large number of traits providing a lot of bonuses, and the fact that each trait makes a considerable difference. They're not just +1% minor passive bonuses; they're all big chunks of effect, usually +20% or more, per point. Jay Wilson: We wanted more customization, and we wanted customization that really spoke to the idea that, ‘I’m going to roleplay my character and focus in one area.’ Skills are really awesome, but when players think of who they are as a character, they don’t tend to think of, “I like to Whirlwind.’ They’ll use Whirlwind with their Barbarian, but it’s not how they define themselves. They think, ‘I’m a Barbarian who’s exceptionally strong or exceptionally tough!’ And that’s what traits are. The affect the core attributes of your character to let you customize and expand them. For the Barbarian we can focus on Inner Rage, which really defines who he is. For the Wizard we can focus on something more magical in nature. So it’s a great opportunity to tell the player more about their character. An alphabetical listing of all known traits. There were 81 traits seen at Blizzcon 2010, though some of the highest level traits were not recorded, and the newly-revealed Demon Hunter class had only five traits. All of these traits are listed on the various class traits pages. This page was last edited on 19 May 2012, at 17:42.